Steve Martin, Jack Black and Owen Wilson star in a pleasant tale of competitive bird-watching that just stubbornly refuses to take true comedic flight. 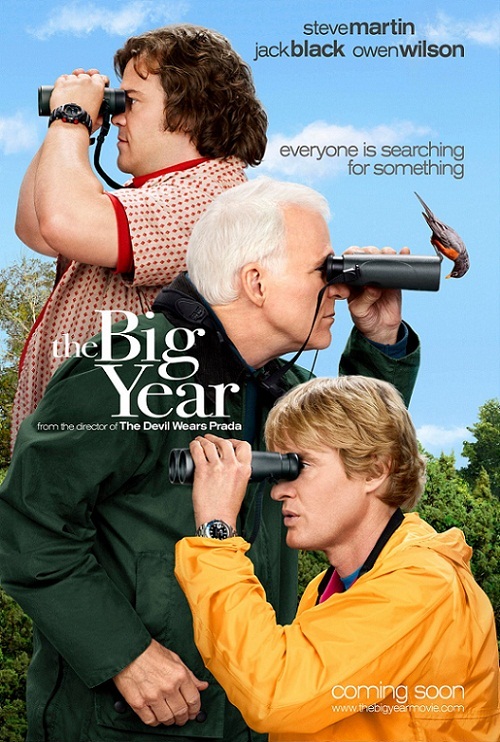 Martin plays the retired CEO of a major company who’s trying to belatedly achieve a ‘big year’, in which he would spot more species of birds in North America in a single calendar year than any other birder. That means spotting more than 700 types of bird. This involves trekking all over the continent on hot tips to spot rare birds like the great snowy owl or the pink-footed goose, travelling to the farthest island tip of Alaska (nearer to Tokyo than Anchorage) for a week to see the Asian wildlife landing there, and chasing major storms that will cause migrating birds to touch down unexpectedly on the Gulf Coast. The lengths to which the birders go results in a number of nicely rendered stampedes and diabolical schemes and tricks as well as a charming travelogue of some of America’s prettiest landscapes. Martin is supported in his absurd quest by his wife, but perpetually harassed by requests from his former lieutenants to head back to NYC to help them with deals. Wilson, by contrast, plays the world-record holder Bostick who is testing the patience of his wife Rosamund Pike to its breaking point. She’s taking hormones to try and conceive, but he’s never around as he’s trying to better his own record to secure his place in the history books as the undisputed best birder of all time. Black is the singleton of the trio, a divorced loser who wants to achieve something with his life, and is aided by his mother Dianne Wiest arranging his travel schedule even as his father Bryan Dennehy despairs of the stupidity of his son’s choice of goal. The adorable Rashida Jones crosses his path from time to time as a fellow birder who he just can’t summon up the courage to ask out. It’s a delight to see Anjelica Huston crossing swords with her regular Wes Anderson colleague Wilson, over his mutiny on her birding ship in his previous ‘big year’ quest to see a rare bird rather than the whale she was showcasing to tourists. It’s also amusing to see a veritable pantheon of TV comedy actors including Joel McHale from Community, Kevin Pollak, CSI Miami’s Byron quoting British Person in the lab, Network head Jack and the demented impressionist from Studio 60, as well as Sheldon from The Big Bang Theory as a blogger causing trouble. However, this movie while big hearted, solidly acted, perfectly structured, and nicely subversive of the philosophy of winning at all costs, just doesn’t have enough jokes. There’s one sublime gag but mostly you’ll just chuckle and smile.